Here’s a look into my typical day (a blog post suggested by the MTBOS last year). The day I tracked in particular was Wednesday, October 22nd, 2014. Alarm clock rings. Hit the snooze. My partner gets up w/in the first 10 minutes after the alarm as he gets ready to go & is out the door on his bike to get to his school early too. I sleep a little longer. Turn off the snooze function (after hitting it too many times). I do a quick check for any message on Facebook, Twitter, Instagram & Email before getting dressed, putting on a touch of makeup & pulling my hair into a clip or ponytail. Some days I’ll fry up a couple of eggs on toast for breakfast at home. Other days I wait to eat something at school. Most days I drive. A couple of times per week, when the weather’s nice, I try to bike. The bike ride is 1h10mins so I don’t do it very often. 7:00 – 7:30: Arrive to work. I’m usually the first one in. I make coffee for my colleague & I each day & this morning I waited for breakfast till I got here so I also made some instant oatmeal to eat w/ with my coffee. I cozy up to a computer & try to plan my lessons for the day. I spiral my curriculum (instead of teaching one unit at a time) & try to do activities as often as I can (instead of chalk&talk) but today will be a day to work on practice problems individually. Wednesday mornings are when I’m scheduled to supervise the math help room. I chose a morning slot as my lunches are often filled up with club meetings. But mornings do not seem to be a popular choice & I often find myself sitting alone waiting for kids to come by. Classes start at 9am & I make my best effort to be waiting outside my classroom door to greet my students. This allows me also to keep an eye on the hallway activities during a very busy time & try to hurry along those that are busy chatting by their lockers instead of getting to class on time. I like it too because I get to say hello to past students I’ve taught as they head past me in the hall. 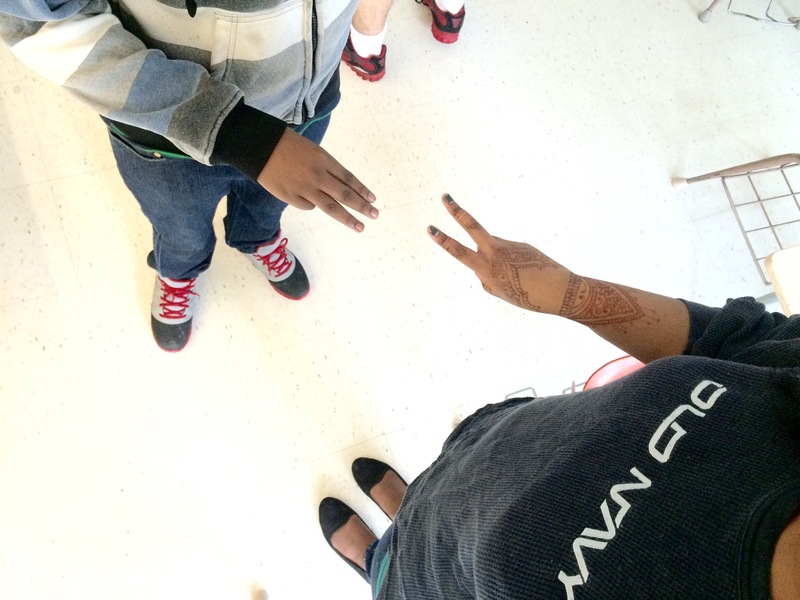 I’ve had some great interactions with students I’ve never even taught, simply because I was hanging out in the hall as they were heading by – spend more time in the halls with the kids if you can! As my students arrive, I hand them each a numbered playing card from 1 to 6. This tells them their group number for the day; every day they sit at a different group with different partners (visibly random groups). Bell rings. We all stand for Oh Canada. Today’s bellwork was a game of fast fingers so we jumped right into that. I chose this game because it gets the kids up & active since we’ll be doing seat work afterwards. Today’s task is to work individually on practice problems for linear systems of equations. They are working individually, but still seated in their groups (max of 3 to a group). Each group has an extra desk so that myself or my peer-tutor this period can sit with the group and help them when they get stuck on a problem. Today I’ve given my students the choice: they can work on a set of systems problems in their Khan Academy accounts, or they can work out of the textbook. Some students don’t have a smartphone or don’t want to drain its battery & so choose the textbook instead. A few have just decided they don’t like khanacademy for whatever reason; others love it. I also have a few iPads that belong to the math department that I brought in to loan out to any students without their own device. I clear out of my classroom as another teacher teaches here during my prep period. This was a bit of an adjustment for me this year as I had my room all to myself last year, and with our growing staff, I gave up my desk in the math office to let a newer teacher take it since I had my classroom. So now I’m a bit of a lost soul during my prep period. I tend to hunker down at the large common table in our math office or on the couch in the CWS/Languages office where my desk used to be a few years ago. Today I head down to the main office in order to post our daily announcements (which are submitted to our office administrator) on our Twitter account. On my way into the office, a colleague comes out & tells me that shots have been fired on Parliament Hill! I head in, post the announcements & by the time I come back out to head back to my office to work our administration team is all out in the halls & we have been told by the school board to put the school in “shelter in place” mode. In hindsight, we now know that there was only one shooter, but that morning there were rumours of several shooters & their whereabouts were unclear (the day’s events described here). Shelter in place means that nobody goes in or out of the school building, but we can move around inside (as opposed to a lockdown or secure school mode). We need to block all exits, and so I offer to go stand at the end of the phys. ed. wing to keep students from leaving out the exits there. I spend the rest of period 2 there, checking my Twitter feed for the latest news on the downtown developments. Normally I would have a lunch-time club meeting; Wednesdays is our Spartan Stars meeting (Link Crew). Today, though, with “shelter in place”, no student is allowed to leave at lunchtime, so we have a staff member at every doorway blocking the students from leaving; I’m sure the cafeteria has never seen better business! The students aren’t happy about not getting to go to the plaza down the street for lunch & the hallways are packed! They’re high-school kids so they’re all checking Twitter for the latest news too. I leave my colleagues who have preps next to guard the doors & I head up to my classroom to welcome my afternoon math class. We do the same thing as my first period class. I teach a grade 10 applied class in the morning & again in the afternoon so I try to keep them on track with each other by doing the same each day. Honestly, though, my mind is elsewhere – thinking about the events downtown, wondering about people I know who work downtown being on lock-down, and wondering about the ramifications of this shooter targeting a soldier on sentry duty since my partner is a reservist who will be performing at the site of the shooting – the tomb of the unknown soldier – on Remembrance Day in a few weeks’ time. Just before the end of this class, the principal comes on the PA to announce that the “shelter in place” mode has been lifted, & please proceed to our last period classes. Last class of the day is STARS (what we call our Link Crew at Ridgemont). We cover SMART goals – how to make them. Students are asked to create & share SMART goals about a learning strategy or skill they would like to try & improve this year. A couple of students arrive 30 minutes late with fast food. They say they went to the plaza for lunch after the shelter in place was lifted because they don’t like caf food. I expressed my disappointment that they chose to skip half of my class for that – they could have eaten in the caf today. I warn the students that busses will have delays today & that busses with routes through downtown will be rerouted or cancelled; be prepared for that. I spend some time looking at the latest news on Twitter & CBC’s live blog on the event. It seems that the downtown area & the bridges over to the Quebec side are packed with traffic with police still doing searches for the potential other shooters. I decide to stay at school & get some work done until the traffic subsides. I head to the staff room & settle on a couch there with my laptop & get some marking done. I am teaching a course in the Faculty of Education at the University of Ottawa this semester so I have a lot of marking to do for that course in addition to my high-school classes. I mark some of their math blog review assignments – it takes a few hours; I am a very slow marker. I check Twitter & I’m no longer seeing any warnings about crazy downtown traffic, so I brave the drive home across to the Quebec side. It’s slow moving downtown but I get home eventually. I cook some dinner. My partner gets home from playing hockey about 8pm & we eat dinner together. I veg on the couch at 9pm to watch Republic of Doyle on CBC before going to bed at 10pm. I read a chapter from my current book, Lake in the Clouds, then sleep! Let’s do it all again, tomorrow! Pair off your students. I often ask them to find a partner wearing the same colour shirt, or same colour socks, or that has the same last digit in their phone number, etc. This way they pair up with someone other than their best friend that they always choose. The goal is be the first out of your partnership to state the sum of the fingers shown. So for the photo above, the sum would be 5. The first partner to say 5 (often they SHOUT 5!) wins a point. I ask them to keep playing until one of them reaches 10 points. Once the majority of teams have made it to 10 points, I end that round. Now I have them put their hands back behind their back. This time, I instruct, they will reveal two hands at a time – same task; first person to state the sum of the fingers. This past week I tried a variation by asking them to multiply instead. It worked great with one hand at a time; the students were already familiar with the format of the game as we had played it with addition previously. When we advanced to two hands each we ran into the problem where one of the groups thought they needed to multiply 4 different digits (one for each hand). I explained that, no, I would like them to count each person’s two hands as one digit. For example, in the above photo the student on the left has revealed 5 fingers and the student on the right has revealed 8 fingers. The product would be 40 (not 2 x 3 x 4 x 3 = 72). Although perhaps that would be another version of the game to try in the future! Some groups finish much faster than others. I try to keep an eye on when the majority of groups have reached 10 points & call the end of the round even if some groups aren’t there yet. Alternatively, I suppose you could see who can get the most points in a set amount of time to ensure everyone is finishing at the same time. A lot of research states that Math should not be a timed activity, and I always give my students as much extra time as they need on evaluations. So I sometimes feel like maybe this isn’t the best activity as it asks them to be the quickest multiplier or adder. Quick does not always mean skilled or effective in Math. It can, but it doesn’t always. But I hope that even if it’s a high pressure activity for some students because it’s timed, the fact that only one other student sees their performance (not the whole class) will help mitigate any stress it causes. How could you use Fast Fingers in your classroom?